Why is popping bubble wrap so much fun? Bubble wrap has been around since Creation. It was found in the Garden of Eden, used in particular to protect the fruit on the tree of knowledge of good and evil from Adam and Eve. Unfortunately, it actually ended up tempting Eve to come closer to pop the bubble wrap and thus drew attention to the fruit. Some theologians say almost everything in the Garden of Eden was wrapped in bubble wrap so nothing could get damaged and no-one could get hurt. When sin came along, the bubble wrap was confiscated. Bubble wrap was also used on Noah’s ark to protect the woolly mammoths and handpainted periwinkles. 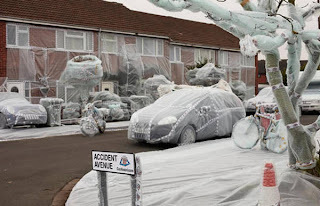 Uzza spent months insisting the Ark of the Covenant needed bubble wrapping for its transportation, and the pyramids were delivered preconstructed, wrapped in bubble wrap. But why do we enjoy popping bubble wrap so much? Psychologists say it relates back to childhood. The less our parents praised us as a child, the more we enjoy popping bubble wrap. Popping bubble wrap gives an instant pop of praise and congratulation, leading to a feeling of achievement. But sociologists say the bubble bursting is because we just want to be like everyone else. Society tells us that popping bubble wrap is fun and if you don’t enjoy it, you won’t fit in with everyone else who pops bubble wrap. There are world bubble-wrap popping tours but these tours obviously steer clear of the 13 countries where it is illegal to pop bubble wrap. Interesting Fact: If we took all the bubble wrap on Earth to Mars and popped it, there would be enough air released into the atmosphere to allow a city of 1 million people to live for 37 seconds.